Walt Disney promotes tobacco and the public is outraged, again. Nobody should be surprised though. Walt Disney and tobacco advertising have a lot in common. What, Disney is advertising tobacco? The story that has reached headlines is as follows: Walt Disney is now a conglomerate of multiple media companies and brands. Marvel, Lucasfilm, Pixar, ABC, ESPN, all those brands belong to Disney. Disney has also a partial stake in the company called Vice Media. We recommend Vice for their documentaries. Vice Media makes money by licensing its content and by creating marketing campaigns with its network of agencies. What causes public outrage is that Vice Media has accepted Philip Morris International (PMI) as its client. PMI, as all readers of K-Message should know is a tobacco manufacturer. It owns top cigarettes brands worldwide, including Marlboro. PMI operates globally with the exception of United States, which is a domain of Altria. Vice Media produces for PMI white label content – videos focused on nightlife. White label means that videos are not branded with Vice logo. The content will not be distributed by Vice channels, PMI is free to do with it what they want. Readers from United States or United Kingdom will probably never see it, due to strict regulations on those markets. Still, Vice is Disney, Disney is Mickey Mouse, and Mickey Mouse cannot promote smoking, or at least this is what newspapers want us to believe. Well, do not believe them. Walt Disney has promoted tobacco for years! 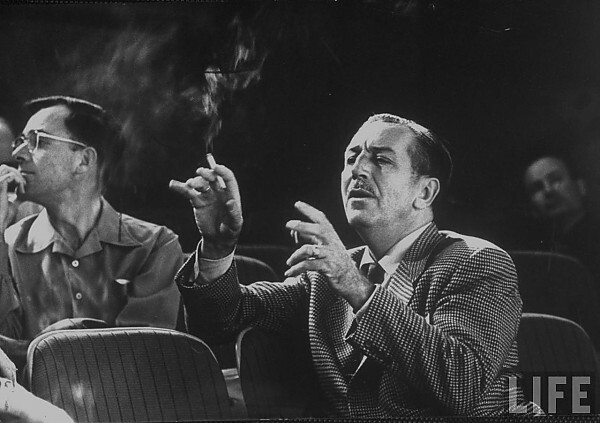 Born in 1901 Walt Disney himself was an avid smoker. He learned the habit as an ambulance driver in France during the First World War. His favourite brand of cigarettes was Lucky Strike, and he also smoked a pipe. In 1955 he opened a tobacconist on Disneyland’s Main Street, which closed in 1991, though its traditional “cigar store Indian” still stands on the pavement outside the location. Disney was aware enough to not smoke amongst children, but he suffered incessant cough. He passed away aged 65 and the cause of death was lung cancer. In Boston, an anti-tobacco group Massachusetts Group Against Smoke Pollution (GASP) launched a protest and informed media. The story has reached Washington, and in September Action for Children’s Television filed a complaint with the Federal Trade Commission (FTC). It asked for tobacco advertising to be banned at “G” and “PG” movies. FTC agreed, called such advertising a “deceptive and unfair trade practices” and has requested extensive documentation on the cinema advertising programme from B&W. When on 23 February 1984, CNN called B&W seeking information on cinema advertising it was informed that the decision had been made to discontinue the programme and that “This decision was made at the highest levels of our company”. Big Tobacco stepped back, but Disney still engaged in tobacco promotion, also in its productions targeted to children. ” Betty Boop serves Camels, Lucky Strikes are making cameo. ” Marlboro seems to be very popular amongst leading female scientists in places where one can find a small dinosaur. Only in May 1991 Walt Disney declared that it will not allow tobacco companies to purchase product placement in its productions. In 2007 Disney went step ahead and stopped showing tobacco products in its own movies (but only those under Disney brand). ” studio has requested smoking ban on its chain-smoking creator played by Tom Hanks. “This comment is will not be long because I am not sure if it ill actually get to Facebook. Unlike the author of this article, I am totally shocked by the video of “Smoking Mickey”. Not only does it show him smoking AND drinking beer and really swilling it down, it apparently sees nothing wrong with him seemingly abusing the turkey he rode to the “Cantino Argentino”. People need to boycott Disney.